This season we were too busy for decorations, much less a holiday card. So we built an internet-connected robot catapult to take care of both. Meet the DECO-TRON 3000, the first ever tree decorating robot powered by our friends and family sitting at home. Visitors to decotron3000.com were able to queue up, first come, first-serve, to hit the launch button and send an ornament at the tree. They were allowed to fire one time only. And while they waited for their turn they were able to watch the action live from a variety of camera angles. 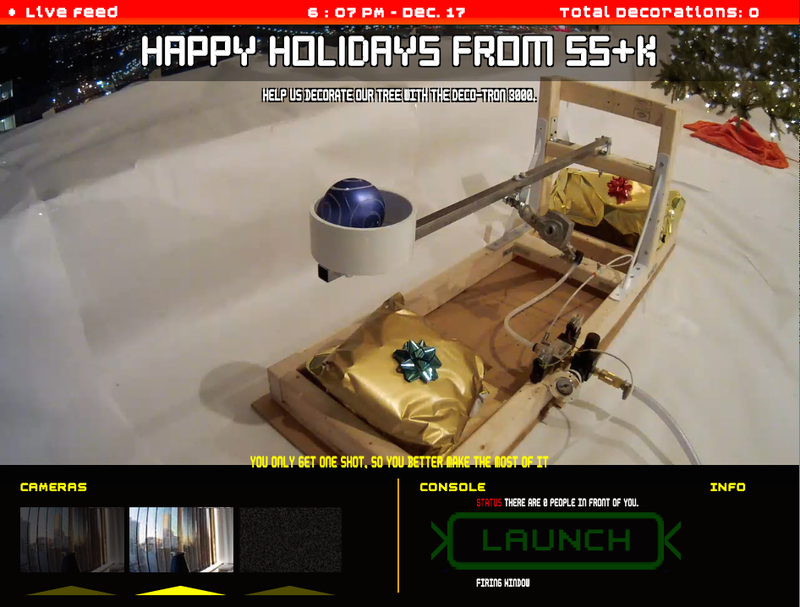 The website’s launch button was connected to the robot’s Arduino board that triggered the catapult arm to fire. Busy employees just had to drop new ornaments into the chute that loaded the catapult within the short window before someone could fire next. The website also included fun easter eggs like a hidden Konami code that triggered that triggered the classic video game Q*Bert for people to play while they wait.